At the end of reviews we gather in a big circle. Thesis students, "rising" thesis students, and even a good number of 1st years were in attendance. The jury and our esteemed thesis faculty form a thin ring on the opposite side. Somehow I ended up behind them, isolated in a corner next to John McGill (2nd year student and editor of AM). He is armed with a shotgun mic. My lips remain sealed during the discussion. I am scribbling frantically when the good stuff comes out. And now, this is the chance to open my mouth. David Ross: There is a strong diversity in the projects. Roddy Creedon: Does the diversity serve us well? DR: It's not just diversity in the type of project, it's a diversity that happens in the middle (in the process). 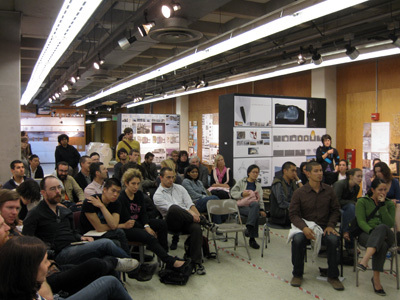 Mark Linder: It's more about range than diversity, the sign of a healthy architecture school. Mark Mack: On the one hand I like the individual obsessions... Form is secondary and that is a good thing. Neal Schwartz: Students should have more confidence. You don't want a discussion about whether or not we accept your world. Have more confidence in the world you have made. John McGill then focuses the discussion on an issue that could mean a huge change in the way the thesis is taught. Some of the faculty are thinking about changing from the individual thesis to a research studio thesis, as has already been done at UCLA, Columbia, and others. The individual thesis, however, is part of the reason that people choose Berkeley (it was a major factor for me). So what does it mean to abolish thesis? DR: The thesis needs to have a thickness (unfortunately I forgot what he meant by that... David, maybe you can fill it in?) There's a willingness to put yourself at risk. Luke Ogrydziak: The point of the jury and the point of thesis are two separate things. The jury is about the jury.... Berkeley is not like other schools in that it cobbles together a bunch of different world views. That leaves some students in isolation. They might form a small group of three which loves the Metabolists (laughter)... You need to shore up your world view with a historical position. Zoe Prillinger: The burden is on the student to situate oneself. NS: Thesis work is an opportunity to place a little bomb in the larger community. RC: This is not a discussion just about thesis. Thesis is a magnified condition of the institution... 3 1/2 year programs do thesis, which is sometimes four years. We do it in three. All of these problems occur in the 201 studios as well. SS: American architecture is the worst. But we have the best schools. It's like Detroit. Architecture is not about self expression. ML: Architecture schools don't teach how to research. SS: Architecture is not a work of genius. We have to get rid of this solipsism. ML: There is a difference between formal and individual obsession. LO: There is an odd tension between being a participant and being critical... In the Bay Area, there is this fear of architecture, of unleashing architecture. I'm surprised by this model of responsibility, that reality is a good thing. The world is shutting down what you can and cannot do (as a designer). People are optimistic about architecture pushing back the apocalypse. Rene Davids: This institution is well positioned to be at the forefront. ZP: Thesis is difficult. It's a confluence of self and your subjective energies. You'll be in the real world the rest of your life. Thesis is a pocket that is difficult to find as a professional. Susan Ubbelohde: It's about learning resistance. And that was it. Well done 09'ers, I can only imagine how far the next class has to go.